Why is Writing an English Diary so Useful? I always recommend my students to write an English diary. The reason is simple: you should write every day because you need to practise as often as you can. It doesn’t need to be long; a few sentences is fine. It’s an easy way to write about things you have learned. It is also a useful way to practise longer sentences because you can think longer about a written sentence. Due to this it can also help your speaking, too. When you write your diary and find you don’t know how to express your ideas, you know you need to find some new, useful vocabulary so it helps you assess yourself. 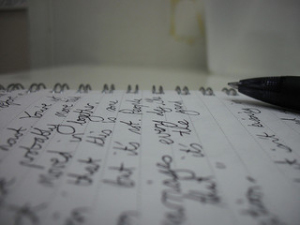 Remember, you are writing your English diary for yourself. Take a look at your diary sometimes and check the sentences. Are they correct? Is there a better way to say what you wanted to say? Make a note in a different coloured pen or pencil. Also, remember, if you miss a day or two, don’t worry. Write next time you remember. If you write just before bedtime or in your lunch break it is easier to keep the habit. You could also start using Twitter in English. Don’t forget to follow me at @getgreatenglish! Evernote is also good for people who want to keep a diary on their mobile phone. Posted on 7 February 2014 3 February 2014 by Marc	This entry was posted in Output, Writing and tagged diary, journal, practice. Bookmark the permalink.